From the lettercolumn of Animal Man #2 (Oct’88), Morrison’s first work in American comics. 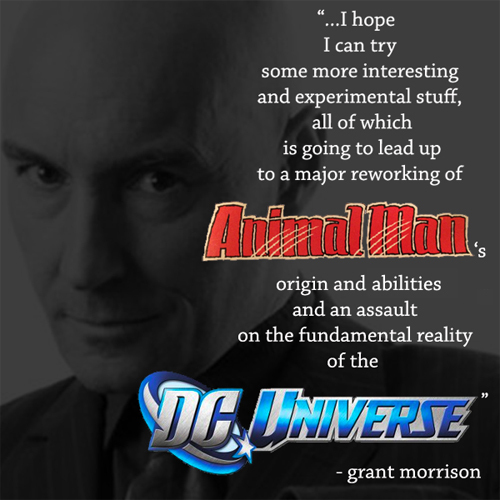 Although these words were written in 1988 and concern his goals for the title alone, expand his words beyond 1988, and beyond the Animal Man comic, and we can use them to create a connection – a road map – from that earliest DC work to the upcoming reality-bending project titled Multiversity. Thanks Peter I’ve been looking forward to Multiversity for a while I think Quietly is drawing an issue and I always love it when they team up. Also after listening to him on Kevin Smith’s Batman Podcast I think his Earth One Wonder Woman OGN is going to be good Morrison seemed to be drawing form her creator William Marston and his wife’s original vision. I remember sitting down and reading Seven Soldiers all at once – and being amazed at how it all connected and how it built on each previous issue. I can only imagine Multiversity is going to blow it out the water. That’s my hope anyway.